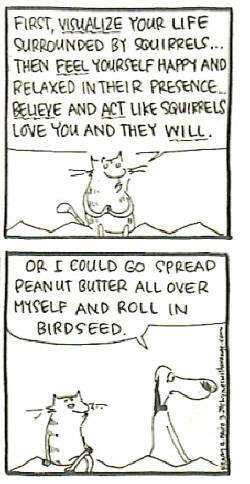 Cartoon reproduced with permission of Hilary Price – see Rhymes With Orange. – Cat’s proposing the Creation Journey – taking the time to positively and joyously vizualize what’s wanted. – Dog’s ready to get into the Action Journey – the one most of us want to leap into because of the way we’ve been trained. We feel compelled to do something, to make something happen. And so we can – but we might find that it’s hard work, or as Dog is likely to find out, doesn’t work at all. Of course there’s nothing wrong with action. But there’ll be a lot less needed, with success guaranteed, if it’s inspired and joyful. SECONDLY – this cartoon “miraculously” appeared in the San Jose Mercury News right at the time I was thinking about how to make this site easier to navigate, and it prompted me to a whole new layout. How cool is that! It’s a perfect illustration of the way the Universe will organize events and circumstances to deliver what we want if we will just take the time to get ourselves into alignment. – If you Do study hard at school, you can Have a good job, and you’ll Be successful. – If you Do eat the right food and exercise, you’ll Have a healthy body, and you’ll Be happy. – If you Do hit the bar scene, or join that club, or get your profile on those matchmaker sites, you’ll Have opportunities to find your perfect mate and then you’ll Be in love/married/living happily ever after. Law Of Attraction … etc. etc. Wrong! We got it backwards from a very early age. It turns out that we need to get the Universe – the powerful orchestrator – on our side. The Universe always responds to our thoughts. To take advantage of this, we have to reverse the process – to BE-DO-HAVE™. that will allow us to HAVE all that we want. If you’re like most of us, you’ve probably been told on various occasions, by parents, friends or others, that “you’ve got to face reality”. This assumes that (a) it’s obvious what this “reality” is, and (b) you can’t change it. In actual truth, reality is not as easy to define as this advice would suggest – see Alternate Realities and for fun, The Truman Show. Furthermore, it’s also true that “facing reality” is bad advice unless your current reality happens to be exactly what you want. For facing reality means accepting it, thinking of it as unchangeable, AND creating a future with more of the same! OK – you say “I’m falling out of the plane at 10,000 feet. How can I not face reality?” To which the reply is “Hang on – it will all be over soon.” Clearly in this environment it’s a little late to be vizualizing you’re way to joy. Or you say “My job is horrible but I have bills to pay. Are you saying I should just quit?” Well in truth if you can feel good about it – yes. But you’re probably going to feel even worse about those bills if you do that. So here’s where it’s important to take some steps to get aligned with what you truly want. It takes a bit of work – different work – different habits of thought. Like some help? For some ideas, processes and support for a new way of doing things, click BE-DO-HAVE try my section on Self-Help. ** Footnote – For the engineers/physicists etc. out there, I know this is simple language to explain a complex phenomenon. It’s definitely language limited by the space/time perceptions we have but can’t even see. “What does a fish know about water?” If we ever get to a Theory Of Everything, perhaps we’ll be better able to describe this vibrational process of “like attracts like”. For the present, I guess it’s an empirical law. It describes what happens. Our option is to take advantage of it. If you’re interested, I have several pages on this site where I wrestle with what actually underlies these principles. For example see Universal Laws and the pages in the section headed “Supernatural?”.